Lauren Pond was chosen by curator Peter Barberie, to win the eighth biennial Center for Documentary Studies/Honickman First Book Prize in Photography for her series "Test of Faith." The images document, as Pond writes, "a family of Pentecostal Holiness serpent handlers that I have photographed since 2011." "Serpent handlers, also known as Signs Followers, hold a literal interpretation of a verse in the New Testament's Gospel of Mark, which states that, among other abilities, true believers shall be able to 'take up serpents.'" 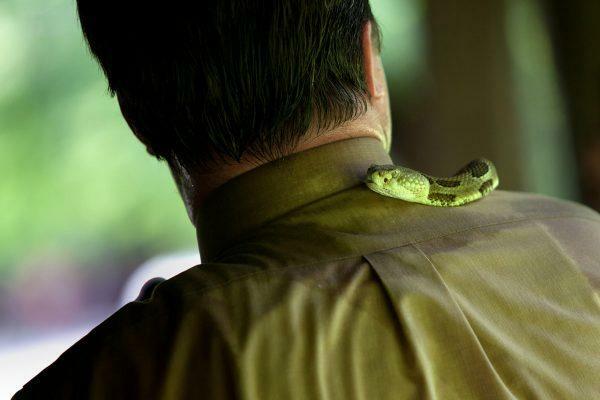 Despite scores of deaths from snakebites and the closure of numerous churches, there remains a small contingent of serpent handlers devoted to keeping the practice alive. "Who are the serpent handlers? What motivates them to keep going? These are questions that I sought to answer when I first traveled to West Virginia and met Pastor Randy "Mack" Wolford, one of the best-known Signs Following preachers in the region. I spent the following year getting to know him and his family, but the course of my project changed dramatically in May 2012 when Mack, then forty-four years old, was bitten by a rattlesnake during a worship service I attended."